In the first two blogs we have covered two parts of our big question, i.e., “What” and “When” to buy or rent real estate property in some of the major cities in India. In this blog we will try to answer and explore, “Where” and “How” to go about buying a real estate property. The question of where to buy or rent real estate property is very generic, and so we will cover it by understanding the current market scenario in some of the major cities in India with the help of a very detailed statistics report which is taken from an article from the Economic Times. The last part of the question, the “How” will be tackled in the end, which will help understand some of the basic legal issues involved, and various options of how to pay for your dream house. Where to Buy/Rent a Real Estate Property? A study of property prices and rents across top eight cities shows where buying is affordable and where living on rent is more cost-effective. DELHI/NCR: The property prices in Delhi (NCR) are very high which makes, while the monthly rentals are low which make renting a better option than buying. Renting is more affordable than paying the monthly home loan EMI even for those with income of up to Rs 25 lacs a year. KOLKATA: As the table below suggests that with a score of 75 for incomes of Rs 8-12 lacs per year the monthly rental are very high, at the same time an individual can’t afford to buy a house in this category. A person with an yearly earning of Rs 13-25 lacs is better off owning a house than renting it. *The methodology used to compile these statistics involved some assumptions which have been explained in the original article. Please check the Economic Times Link shared above for more details. MUMBAI: Mumbai has the reputation of the most expensive destination for real estate. And as a score of 55 suggests, Mumbai has very high property prices as well as monthly rentals, whether they earn Rs 8 lacs or Rs 25 lacs a year. And so, it is advisable to rent a house because a home loan EMI won’t be affordable for an average buyer. 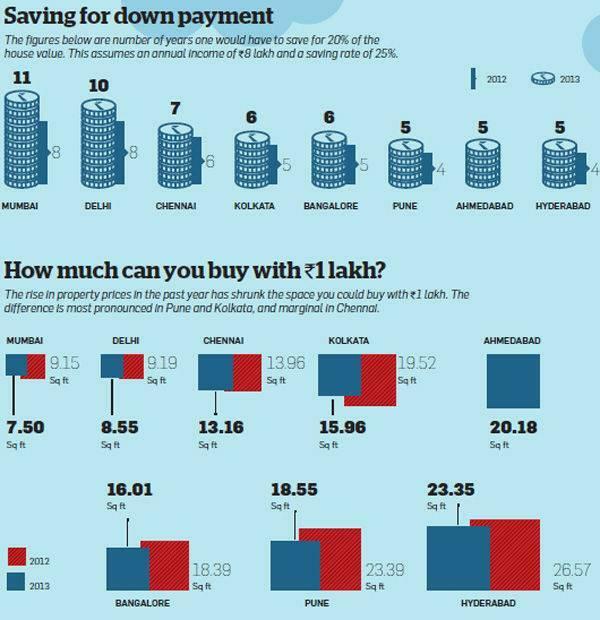 BANGALORE: For those earning who are earning between Rs 8-14 lacs per year will find monthly rentals to be cheaper than buying . While those with an annual income of more than Rs 15 lacs can afford to buy a house, but will find renting to be more cost-effective. PUNE: For buyers who are earning between Rs 8-11 lacs, we recommend that they should live on rent. Those earning between Rs 12-15 lacs are in the neutral zone, suggesting that though they can afford to buy, but they will have to take a prudent decision. And those whose yearly earning is over Rs 15 lacs should buy. CHENNAI: Coming next to Mumbai, Chennai with the score of 55 for those earning Rs 8-19 lacs a year signifies that renting is cheaper than buying by more than 70%. renting will prove to be a better option than buying even for those with an income of Rs 20 lacs. HYDERABAD: A haven for real estate buyers, Hyderabad is a perfect place for an average buyer to invest his savings in property as compared to other major cities. Renting is a viable option for someone who is earning between Rs 8-9 lacs a year. While buying is advisable for those earning Rs 10-11 lacs, though they will have to make a few adjustments, but for those who are earning more than Rs 12 lacs, we recommend buying. AHMEDABAD: For those earning between Rs 8-10 lacs a year, a score of 75 suggests that while monthly rentals are very high, buying is not affordable either. But a potential buyer with an income of more than Rs 12 lacs a year should consider owning a house rather than renting it. Till now we have covered where to buy/rent real estate properties in top eight cities in India, though we have missed out on Gurgaon in our study. We will explore the “How” part in the next blog which is a continuation of the 3rd part. So stay tuned! *This blog contains information, images and some content which is taken from Economic Times. To read the original article please visit Economic Times. This entry was posted in Property Tips and tagged buy a house, buy home, get a home, home buying tips, home on rent, purchase a home on January 8, 2014 by Admin.